The Mini Driving School in Reigate offers dedicated experienced instructors who can help you build up your knowledge from novice to expert. Our emphasis is on making students into the safest, most well-equipped drivers they can be, so we cover all aspects of driving in an affordable, flexible way that will suit you. Learn to drive in Reigate now! Call 0800 511 8888. 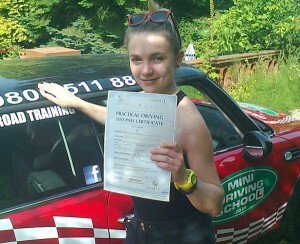 Our driving school in Reigate is dedicated to teaching you to drive in a comfortable and safe way. You can choose which vehicle you learn in and whether you want to focus more on automatic or manual cars. We will also give you all the theoretical skills needed to pass your theory test on the first try. Your instructor at Mini Driving School Reigate will be able to assess your level of skill and experience and adapt your driving lessons to suit you and your driving style, even if you are completely new to driving. They will then tailor their lessons to your style of learning to make sure you get the most out of your lessons. All of our instructor’s aim to teach you to be at a level where you can drive comfortably and confidently on your own without our help. We will teach you all the things you will need to know about driving including how to read road signs and driving in real road conditions – we will evaluate your progress and mistakes to help you improve in the areas you’re struggling with. A good driving school is vital for learning properly and quickly, good quality lessons make great quality drivers. If you learned to drive outside the UK, a good driving school, like Mini Driving School, will also be able to help you “relearn” how to drive easily on the left side of the road, without the stress and danger of trying to do it unaided! At the Mini Driving School in Reigate, we only use the most up-to-date model BMW Minis to teach our students as we believe that a high-quality car is needed the best quality lessons. We use the most effective methods and standards in our teaching. Our aim is to provide the essential teaching and guidance for students to pass their test on the first try as well as being safe, confident and reliable on the roads, thus saving them wasted time, money, effort and risks as well as getting them on the road and qualified as soon as possible! All of our courses in Reigate are competitively priced against our competitors in the area and we have flexible schedules for your convenience. We offer a Pass Plus course for drivers who have already passed their test and would like a refresher lesson to keep on top of their driving skills to ensure safety and confidence. In the Pass Plus course, we will also teach you how to drive in varied weather conditions as well as on the motorway as many drivers struggle with their confidence in these two areas, even after passing their tests. The Pass Plus course is also favoured by insurance companies, possibly opening up doors to cheaper insurance.